You come off as distant, listening to other people's conversations, but ultimately concerned with your own existential worries. You've recently been tackling a specific problem you can't quite solve, but trust yourself to solve it. Make your decisions and stick to them. And by the way, a place where you can surround yourself with truisms such as these has just opened up in Sydney. It is called The Ultimo, and is the world's first astrology-themed hotel, and its astrology-packaged rooms start at $229 a night. The skeptics among us may scoff, but It actually looks like a pretty fun stay. 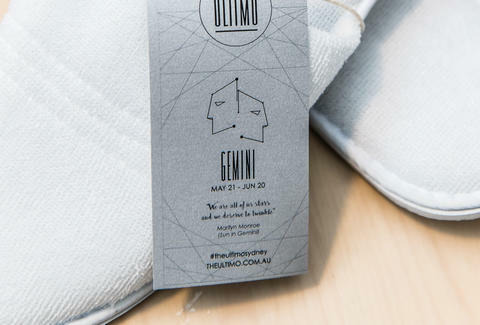 The Ultimo's got a variety of rooms and accommodations, all of which come with literature, artwork, and even slippers tailored to astrological signs. 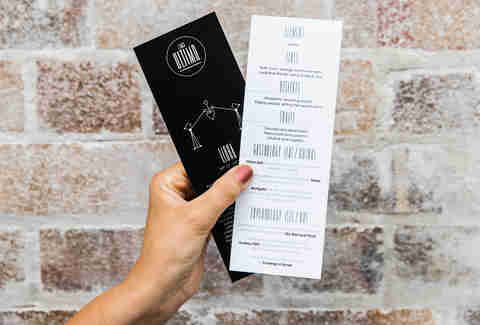 They additionally create guides to Sydney and curate experiences for you based on your astrological sign, following categories like "Gastrology" for food and drink and "Experiology" for stuff to do. 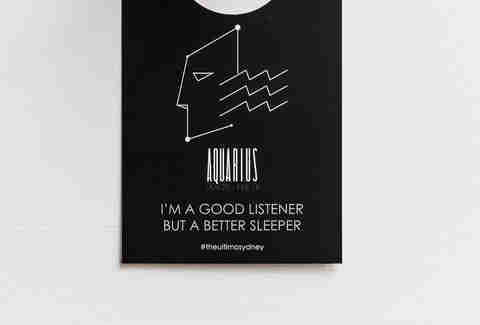 The Pisces one, for example, opens with a bit of casual flattery -- "Known as the official dreamers of The Zodiac, Pisces like nothing more than the chance to drift off on a moonbeam" -- before diving into a couple of brief lists of your traits, likes, dislikes, and recommendations. All of this is curated by the hotel's astrologer Damian Rocks -- a player in the Australian astrology community and founder of the organization Stars Like You. On some level, you just have to trust he knows what he's doing. He has previously pointed out over tea and scones on an Australian talk show that astrology is a 6,000-year-old study of patterns and compared it to weather forecasting. He also teaches a $2,800-dollar "Diploma in Predictive and Therapeutic Astrology" course. Take all that however you will. Naturally, this hotel isn't for everyone. But if you're booking a trip to Sydney and you're the type of person who frantically checks their horoscope every day, feel free to check it out. Maybe even check out this Buzzfeed Australia review that the hotel covered the bill for. (The Ultimo did not respond to requests for comment.) Maybe even bring your dog, if you're willing to shell out a couple hundred dollars extra per night to stay in one of the courtyard rooms on the roof of the hotel. To the hotel's credit, it all looks like a very nice stay. If you decide on trying it out, make your decision and stick to it. Leave the existential worries behind.